Posted on March 18, 2019 at 12:44 pm. In our rails-to-trails series, we first looked at the basics of urban renewal, how rails-to-trails projects fit in, and why municipalities, counties, and states would want to take part. Next, we will cover the considerations when lighting a trail to ensure trail safety. Trails may be convenient during the day, but they often must close at sundown—which can limit their use, especially in winter months with shorter hours of daylight. Proper signage and after-dark policies may help, but installing effective lighting is an even better way to increase the sense of safety for trail users. Here are five things to consider to effectively light your rail-trail project. #1: Consider what the community wants. Properly assessed lighting considers who will be using the trail and for what purpose. What types of trail users are there? Commuters traveling after dark, especially in winter, will likely need and want more lighting than weekend visitors, who may be more likely to stick to daylight hours for their activities. In addition, there must be a proper environmental assessment to ensure the local ecology won’t be negatively affected by the lighting. 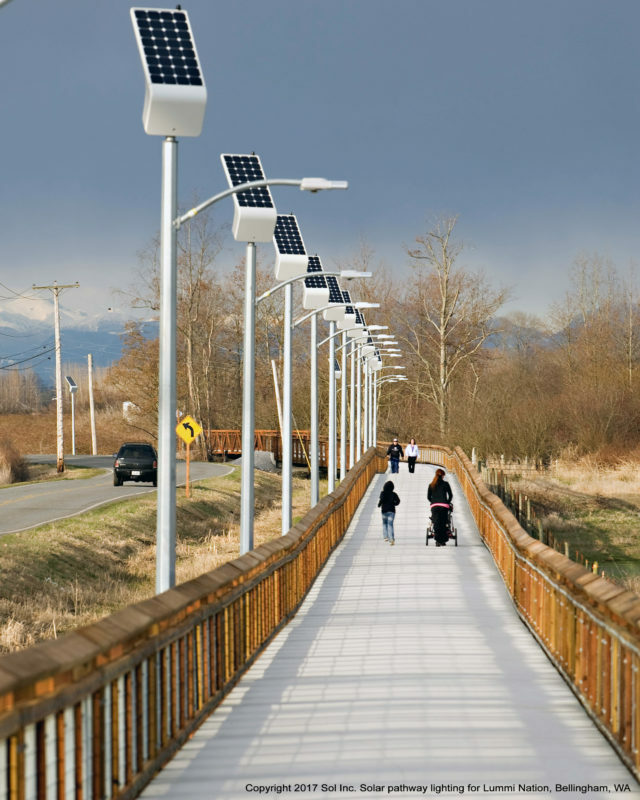 For example, the pathway lights on the Haxton Way Trail in the Lummi Nation of Washington state needed to ensure the surrounding wetlands were not disturbed by trenching for wiring infrastructure. 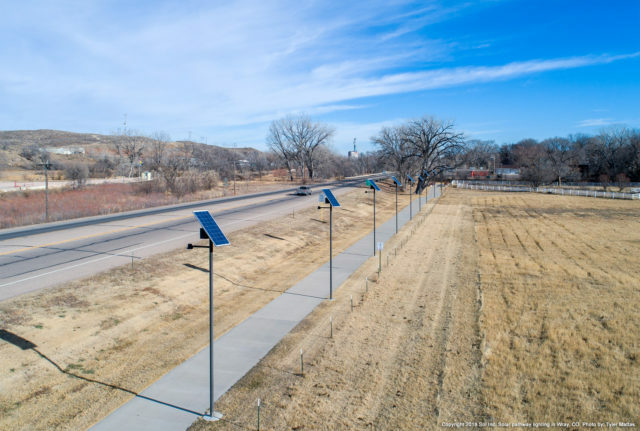 They chose solar lights, which don’t require trenching to install, protecting the delicate wetland while still giving the community a safer alternative to walking along the nearby highway shoulder. #2: Consider what lighting type works for the physical location. There are several considerations for lighting on a trail. Wired lighting may require little maintenance over time, but it is expensive to install and may not be feasible in riparian corridors or anywhere that environmental disruption is not permitted. Battery-powered lighting may be cheap and easy to repair, but it is not reliable and requires frequent maintenance for battery changes. A solar-powered light combines the reliability of a wired light with the simplicity of installation of a battery-powered light. With no trenching required for cables, it is environmentally friendly and simple to maintain. Solar-powered trail lights are reliable as long as they are sized correctly for the location and are not heavily shaded by trees or structures, which can make solar less viable in certain areas. #3: Consider what lighting placement and design will work for the trail location and use. Once you’ve selected the type of lights that will work for the location, consider the design of the lights and how they will be placed for maximum effectiveness. Licensed lighting professionals can help with this. Meet AASHTO recommendations: Lights should meet the American Association of State Highway and Transportation Officials’ (AASHTO) Guide for the Development of Bicycle Facilities requirements for lighting shared-use paths. Light only what’s needed: Lights should be shielded, pointing only at the ground and not into the sky to help minimize light pollution, which affects people, animals, and the environment. Be appropriate: Lights should be scaled effectively for trail use and spaced properly for adequate coverage. Be placed where required for safety: That includes at tunnels and overpasses; trailheads; bridge entrances and exits; public gathering places; along streets; crosswalks; where the path crosses another path or sidewalk; and on signage, according to AASHTO guidelines. Be aesthetically pleasing: While not a requirement, lights that have a warm-white glow rather than a blue-white glow are more pleasant to the eye. In the past, achieving this color with LEDs was more of a challenge, but today’s technology is making it possible to provide a warm-white LED light without breaking the bank. #4: Consider who will be installing and maintaining the lights. It is one thing to choose lights for the end-users, but it’s another to choose lights that will be cost-effective to install and maintain. Installation varies by location and type of light, so running a cost comparison can be a good place to start. Meanwhile, maintenance can be a challenge for cities with budgets already stretched thin. For wired lights, a problem with one can cause a whole string to go out. Battery-powered lights avoid this problem, but if the lights are not configured properly, the maintenance team may be out changing batteries more frequently than they would like. Solar lighting can also have this problem if the solar panel and batteries are not sized properly for the location and light output requirements. #5: Consider how you’ll find funding that fits. Who is paying for the lights and how? We’ll explore funding in the next article in this series: read about federal and state funding options here. 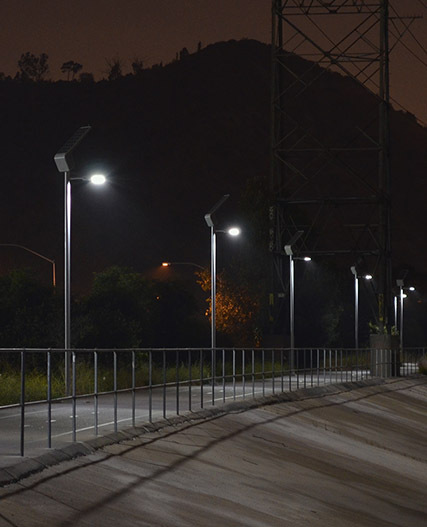 Whether you are lighting a rail trail, commuter path, or another urban pathway, solar lighting can be a good fit. To find out the viability of lighting your rail trail with solar lighting, try our Build & Price tool. It can determine the estimated cost of solar trail lights and the configurations required to keep them working for the long term.